ANTHRAX, THE MISFITS, SEVENDUST, TANTRIC, DIO, QUIET RIOT, MASTODON, TESTAMENT, THE NIXONS, FEAR FACTORY, THE CULT, BOBAFLEX, SWORN ENEMY, WALLS OF JERICHO, just to name a few. Compton has rocked out everywhere from California to New York City and everywhere in between. Toured Europe for 4 months in 2001 with the band Second Face. His goal in life is to play music, have fun, and just do what he loves to do. 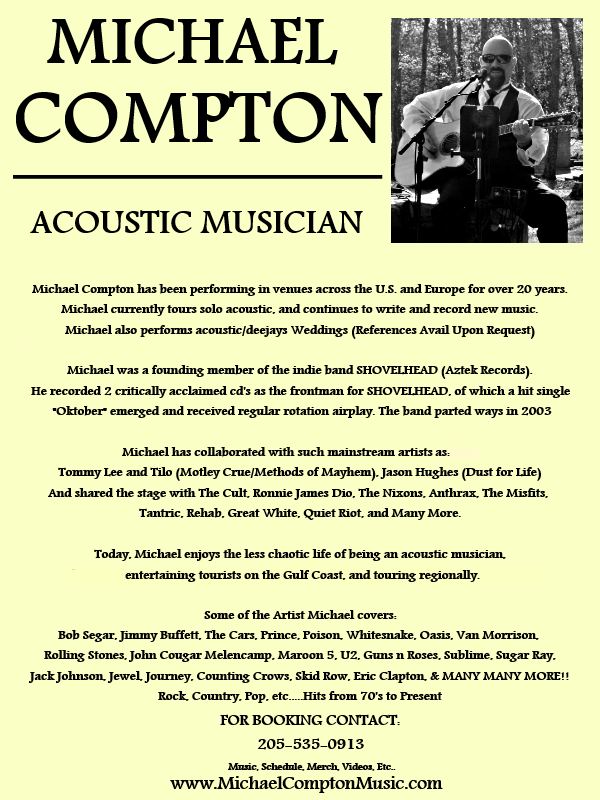 Michael Compton continues play acoustic shows around the "Emerald Coast" at Beach Clubs and Resorts. And tour regionally all over the Midwest and Southeast.